Pat McPherson rattles off facts about his town water system as easily as some people cite baseball stats. He knows that two companies—one public, one private—maintain pipes and treat water in his inland Southern California community. He knows where the border lies. "You could live in the city of Ojai, and on one side of the street your water bill is $150 and on the other side it's $650," he says. 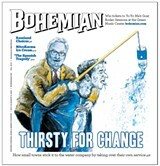 The private company issuing the higher bill is called Golden State Water, and it's structured and regulated much like Cal Water, which serves remote parts of Sonoma and Marin and was the focus of a recent Bohemian cover story ("Wrung Dry," May 29). It's similar in another way, too: ratepayers complain of costs so steep they're killing the town. "We saw that the city could actually disappear," McPherson says. After all, shops, restaurants and other players in the town's tourist industry depend on water, and sky-high utility rates threaten their very existence. According to McPherson, even the school district is currently shelling out as much as $65,000 a year on what has come to be a precious and costly resource. 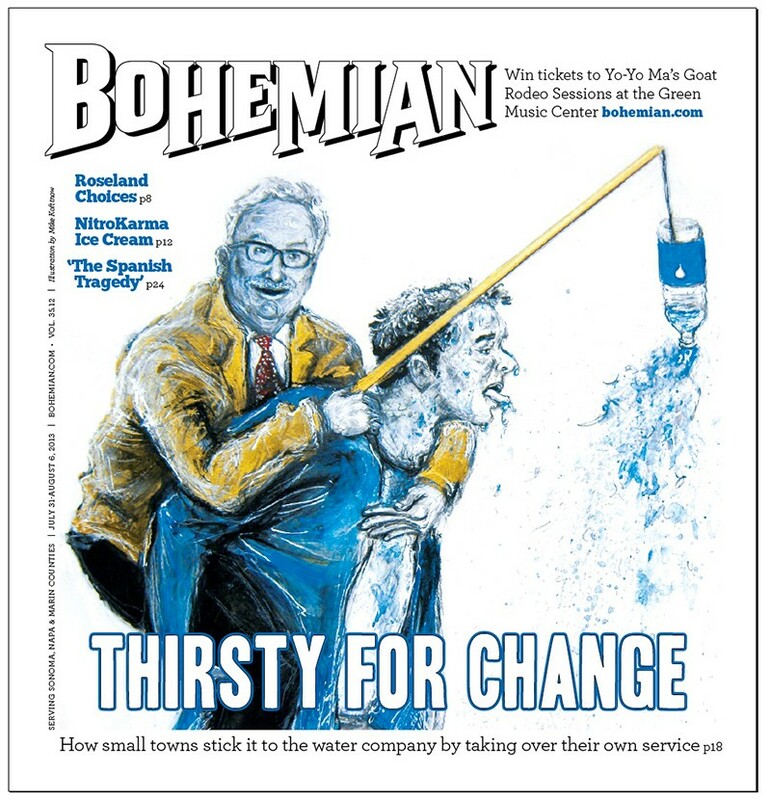 In May, we examined how rates often skyrocket in small towns served by investor-owned water utilities—many of them remote areas with high poverty rates. Marysville in Yuba County, for example, has a poverty rate of almost 26 percent; residents pay between $80 and $350 a month for water, according to resident Connie Walczak, and the town faces a possible rate hike of nearly 50 percent. Unlike energy utilities, those providing water can't spread the cost of service across a vast, statewide base. Per California's regulating Public Utilities Commission (PUC), each community pays for its own cost of treatment and service, which means that a town of roughly 200, like Dillon Beach in Marin, can get strapped with exponentially more dollars per household than a district with thousands—or hundreds of thousands—of hookups. Dillon Beach residents compensate any way they can: showering once a week, abandoning gardens and buying only dark clothing, so they can wash it less. But with fees leaving small districts for Cal Water's headquarters—where the CEO drove an $85,000 car, board members were paid thousands per meeting and rate increases were requested to pay the salasries of employees who then weren't even hired—some ratepayers we met in May felt their steep fees were unjust. In Lake County's Lucerne, especially, a group was pushing to oust the private company entirely. A group of citizens in Marysville have filed a formal complaint with the PUC, and the town may be heading toward localization as well. But is it possible to overthrow your water company? McPherson is part of Ojai FLOW (Friends of Locally Owned Water), an organization also trying to reclaim its city water infrastructure. This would require eminent domain and 66 percent of the town vote, and it sounds like an underdog story too optimistic to exist off-screen: a city of just over 7,000 vs. a water company serving roughly 250,000. You do the math. But it has been done. What's more, according to a man whose town actually did declare independence from the company running its pipes, the smaller the community, the better. Felton is a town of roughly 4,000 that sits along winding, redwood-lined Highway 9 east of Santa Cruz. It resembles Guerneville. Rustic cabins sit atop long bumpy driveways and line the San Lorenzo River on stilts. It's not the kind of place you'd expect a door-to-door petition to succeed. But it did, and according to Jim Graham, spokesperson for Felton FLOW, the reason was both simple and surprising: people knew their neighbors. Graham says that the effort to oust California American Water, another investor-owned utility regulated by the PUC, began when the company requested a 78 percent rate increase in 2003. He estimates that bills were already twice the amount paid to the nearby public utility, San Lorenzo Valley Water District (SLVWD). So a group of ratepayers gathered at the small downtown fire district, discussing how they could take back their water—which runs cold and free through the misty state parks surrounding the town. They decided to go door-to-door.